Lasang Pinoy 20: Lumpiang Shanghai Binalot! See what else is cooking! View the Lasang Pinoy 20 Round-up at Unofficial Cook. There’s a line that goes, there’s no Pancit Canton in Canton, nor Lumpiang Shanghai in Shanghai. Regardless of the misnomer, the lack of authentic Shanghai origins should never stop anyone from enjoying a good Lumpiang Shanghai. Lumpiang Shanghai, more commonly known as Spring Rolls, are deep-fried “dumpling logs.” Made of ground pork, shrimp, and veggies, the resulting mixture is put on Lumpia wrapper. It’s then rolled and fried until crisp and golden brown. 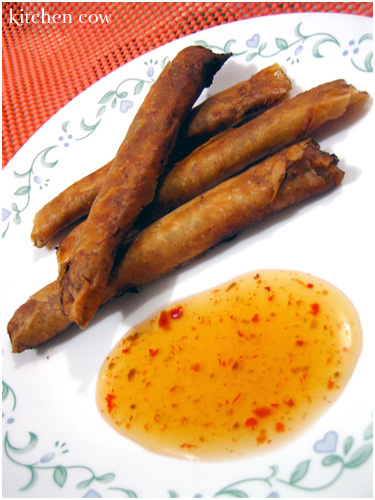 Commonly served with sweet and sour sauce for dipping, Lumpiang Shanghai is popular as finger food, or with rice. A mix of savory flavors and crisp textures, it’s one dish that’s always welcome, whether it be a fancy party, a fiesta, or an everyday meal. This is one Binalot (wrapped) dish that’s sure to please. Recipes for Lumpiang Shanghai vary, depending from household to household. The one I’m sharing here is our family’s version. Sometimes, I tweak this recipe as well by adding chopped shiitake mushrooms, but for this particular entry, I’m doing the purist version. 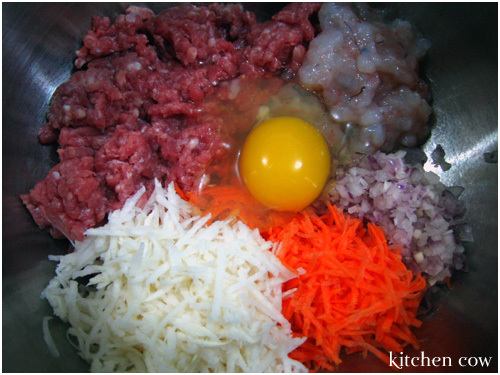 Mix together pork, shrimp, onion, carrots, jicamas, egg and soy sauce. On one lumpia wrapper, drop a small amount of the mix. Using a spoon, form the filling into one long cylinder. Roll the wrapper tightly, completely encasing the meat. Lumpiang Shanghai freezes well! After wrapping, lay the cylinders inside a freezer safe container, placing a sheet of wax paper or cling wrap in between layers. When cooking, fry slowly under low to medium heat to ensure that the insides are cooked. No need to defrost. This entry was posted in blog carnivals, recipes. Bookmark the permalink. 25 Responses to Lasang Pinoy 20: Lumpiang Shanghai Binalot! Your lumpiang shanghai looks good! Yey! Another lumpia LP entry! Skip the jicamas if you can’t find them. Just add a little more carrot? I know some people substitute water chestnuts but I haven’t tried it myself. It does sound feasible though since they have similar textures. It’s definitely easy, but the wrapping can get tedious. Hahaha, you had me hitting my head on the desk when I saw you do Lumpiang Shanghai for LP20 too. But I figured, it won’t be that bad since there’s a slight diff in the ingredients. Besides, I had already bought most of the ingredients. I hope you don’t mind if I edit this to link to your recipe? Especially since yours has a recipe for the Sweet and Sour Sauce. It’s perfectly all right with me, Kaoko! Well… you did prepare the whole thing for the event. Unlike me, still out of town at this very moment but with my HD full of food pics kaya namili na lang sa mga naluto ko na weeks/months ago hehehehe. I’m the one who cheated! My grandmother always seems to have a stash of frozen lumpiang shanghai in her freezer. It’s one of the things I look forward to whenever I visit her. Thanks for your recipe. btw, found you through Lasang Pinoy. That’s not cheating, you still did all the work. Thanks again, too. I’ve been to your blog before! It’s the one with the nice pictures right? Just forgot to drop by again because I wasn’t able to RSS it. Gawan ko nga ng paraan later, I enjoy reading your entries. Really? I had no idea two different kinds of wrapping paper is used for the fried and fresh rolls. We just use the same one, it’s a flour based wrapper I think. We use a different sauce for dipping but I’m familiar with that sauce you described since I always mix it with sriracha when I eat a bowl of Pho. Aaaah, so that’s the rice paper you have to soften. I was googling for links about it a few days ago when the instructions that you have to dip it in water confused me. It really is rice paper! I mean, I remember you cook rice noodles that way too. Thanks for the heads-up! Now THAT’S the recipe that I remember from my teen years when my filipina friends would invite me for supper. My attempts have be semi-successful as of late, but they were missing that certain something that made the lumpia such a savory contrast to the sweet-and-sour dipping sauce. I vow to try again … Thanks for filling in the missing aspects to my recipe. Hi Zhey! I haven’t tried using any meat other than pork for this recipe and honestly, I’m not quite sure if ground beef will work. I know some people try this with ground chicken (not me personally) but it might yield a closer result than beef. Personally, I wouldn’t try beef though. i like reading food blogs because i am always seeking for new recipes.;-. Crisel, sorry for the late reply. It never occurred to me to count how many rolls it makes (FAIL!) but I estimate it’s enough to feed a family of 5 or so? our specialty here at LUCKY’S SHANGHAI HAUZ is the lumpiang shanghai (our best seller here)…ALL who ate here are really satisfied (two thumbs!!!) you should try it too! if you’ll visit sagada mtn prov. pls dont forget to drop by at our place…mura nmasarap p thank you!